Observation - Unidentified mushroom - UK and Ireland. Description: Orange mushroom 2-3cm across with dark brown stem. Growing in the shade of pine plantation on sandy soil. Orange mushroom 2-3cm across with dark brown stem. 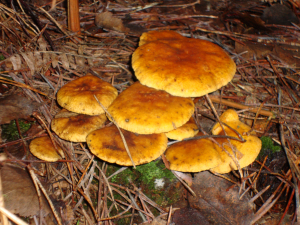 Growing in the shade of pine plantation on sandy soil.